Yesterday, Apple released a new version of its operating system for late-model iPhones, iPads, and iPod Touches, just 2 days in advance of the scheduled appearance of the company’s new flagship, the iPhone 5. A Swamplot reader who took the plunge immediately and upgraded his iPad to iOS6 has been enjoying tours of Houston within the included brand-new built-in Maps application, which in the updated operating system is built by Apple instead of Google. “Notice anything odd about these maps?” the reader asks. Just a few things so far, the reader answers for us. F’rinstance, a mysterious “City Tubercular Hospital” appears to have alighted on the vacant block west of Dunlavy off Allen Parkway where a portion of the Allen House Apartments used to stand. A large chunk of the Regent Square mixed-use development has been planned for that location since 2008. The data for Apple’s new Maps app, which the company brags could be considered “the most beautiful, powerful mapping service ever,” reportedly comes from TomTom NV (TOM2) and OpenStreetMap. There’s no Bayou Bent Collection or City Tubercular Hospital locatable on the web version of OpenStreetMap, however. 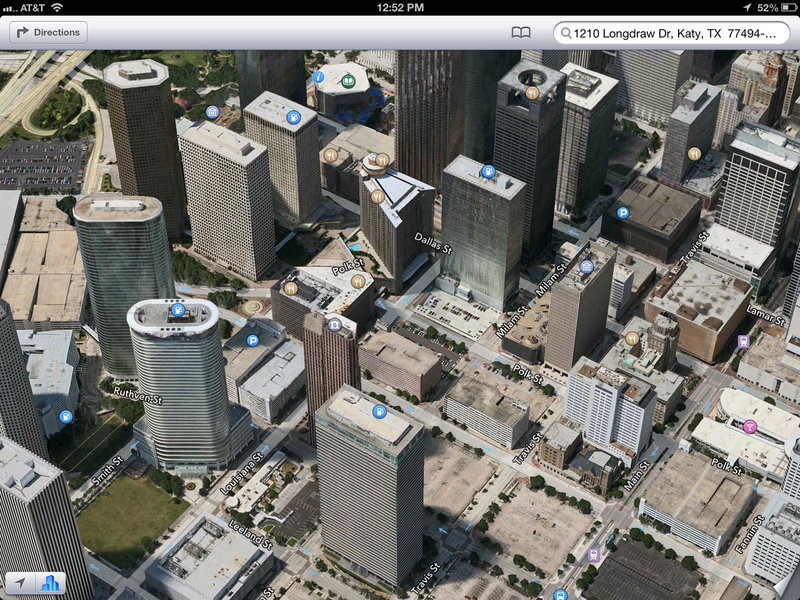 Any other peculiar Houston sites you’re now seeing for the first time on Apple devices? Send them in! Two-thirds of Memorial Park has gone missing. The Cockrell Butterfly Garden has been moved to the middle of Hermann Park. And seeing as how Houston is the Bayou City, shouldn’t this map show some bayous? . . . Apple has left out a lot of place names that were in Google maps and they’ve misidentified others, plus they left out the bike trails which Google kept updated. I upgraded this morning and the thing that really pissed me off that there is no more Street Views… WTF, is this the 1990’s? Additionally the detail level has been greatly reduced, a lot of smaller streets that exist on Google Maps, no longer exist on Apple Maps. This is the worst upgrade since low flow shower heads! As a BCM med student, I delivered over 100 babies over there. JD was the busiest obstetric hospital in the world 20-30 years ago; it was the destination for hordes of illegals to deliver. I’ll never forget this one G19, P18 grunting and launching her little one into the world, and me making the bare-handed grab in mid-air. I also did a pulmonary elective on the Tb ward at JD. That place provided a fantastic clinical education. I’m sad to see it so long gone. I hate that there is no longer street view. Yeah, gladly use my Windows Phone (and eagerly awaiting WP8) where Nokia Maps are used and have a bigger reach around the world even compared to Google. The Open Street Maps project is a great thing and these errors you are seeing in the Apple maps can be quickly fixed on Open Street Maps by the users. I doubt the updates transfer over to Apple maps as quickly. Apple has decided that you don’t need street level views and other map features. You will adjust to life without it. Nothing will prevent you from buying the next Apple device. Detest not having street views as I used it fairly often. I don’t understand why Google doesn’t release the former Google Maps as an app in the App Store like they did for YouTube. And don’t say Google Earth, that app is too slow and clunky. Apple would much prefer you use *their* app on *their* phone. I don’t think Google’s wishes ever entered the picture. This alone might be enough to make me stick with android. I’m up for a new phone and can’t decide whether I want to get a galaxy s3, or drink the koolaid and get an iphone 5. I like android, sim cards, and the option to swap out my battery if I need to.. but am curious about all the hype. The amazing rooftop gas stations of downtown Houston! Not really of course: oil company HQ’s. Short term workaround is to go to maps.google.com on your iOS6 iPhone/iPad. You can add the link to your home page. The maps you receive this way are formatted iOS friendly. Still no streetview for now though. I remember when Apple made the announcement of splitting from Google to roll their own maps program, that Google announced they would be releasing Google Maps for iOS. Assuming Apple doesn’t block the app, you’ll have street views back, and Google’s own navigation. Good luck iPhone users. Swamplot readers rock. Midtown roof-top gas stations! Love Lauren’s pastoral TB link. The new maps from Apple in IOS 6 are definitely a step in the wrong direction at best. Total loss of public transit options, now I need to download numerous apps for different cities. Total loss of all sidewalks through parks, which is useful for walking directions. And of course no bike lanes. Honestly I don’t see myself getting the iPhone 5 unless this is corrected. Relax, Google has already submitted their maps application and it will be approved. You’ll have the old maps back as an option soon. Think of it as when you buy a new Mac laptop/desktop. You get Safari by default, even though Chrome is better. Simple solution: Download Chrome. I personally like the new iOS6 maps better — save for the lack of streetview. Steve, although I might switch to the Nokia 920, I find the iPhone 5 to be the best phone on the market in almost every way.